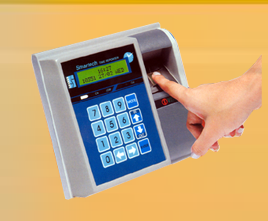 Standalone Time Reporter is a low cost swipe card based time recording system. In this system each employee is provided with an ID card which he/she has to swipe to record his/her in and out timing. Based on the user programmable shift timings and other settings the system generates various reports which can be taken by directly connecting it to Dot matrix/ Inkjet printer. It is ideal for small organizations with up to 80 employees. • Works alone. Computer is not required to process data and generate reports. • Quick generation of reports. • Significant saving of man-hours in generation of reports and pay slip. Depending on the cost, no. of employees and the work environment one of the following card technology can be selected. Employee number when the card is swiped. 16key alphanumeric keypad to program the employee details, shift timings, company timing rules, date, time, etc. In case the employee forgets to punch or his card is lost or is not ready the 16 key numeric keypad can be utilised to manually record the employee in/ out timings. Time Reporters Non- volatile memory retains recorded data for over ten years. • LED indicator for "OK" card reading. • LED indicator for Battery Low. Time Reporter can also be programmed to operate siren at different times in day. • Memory holds swipes of last 36 days. • Records data equivalent to 4 swipes/day of up to 80employees. • Prints daily, periodic & summary report directly on a centronics compatible printer. • User friendly menu - driven programming and generation of reports. • Dimension: 6.4" H X 6.8'W X 4"D.
• Power Requirement: 230 V'AC+ / -15%, 5 watts. • In built battery backup for operation in case of power failure. • Manages up to 4 shifts and 8 categories and 8 companies. This report gives you no of days present, no of late arrivals, no of early departures, etc. of a employee for a given period.